PROFS president Dorothy Farrar Edwards will present the PROFS Annual Report for 2017-18 (below) to the Faculty Senate Monday, March 4. The senate meets in Room 272 Bascom Hall at 3:30 pm. A full agenda of the meeting is here. Faculty senators and visitors are invited to join PROFS for refreshments in the rotunda area outside Room 272 Bascom Hall beginning at 3 pm. PROFS president Dorothy Farrar Edwards will present the PROFS Annual Report for 2016-17 (below) to the Faculty Senate Monday, December 4. The senate meets in Room 272 Bascom Hall at 3:30 pm. A full agenda of the meeting is here. PROFS president Judith Burstyn will present the PROFS Annual Report for 2015-16 to the Faculty Senate Monday, December 5. The senate meets in Room 272 Bascom Hall at 3:30 pm. A full agenda of the meeting is here. University of Wisconsin System President Ray Cross recently discussed no confidence votes by faculty at several UW campuses on UpFront with Mike Gousha. The University of Wisconsin-Madison Faculty Senate adopted the amended resolution below on Monday, May 2, 2016. Audio from the meeting is embedded below. Faculty Senator Chad Goldberg plans to introduce the following motion at the Senate meeting Monday, May 2. 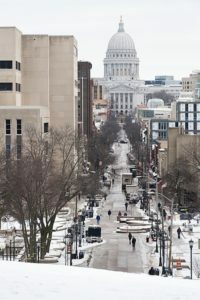 The University of Wisconsin-Madison University Committee approved a proposal outlining faculty layoff policies Monday. The policy, written by an ad hoc faculty committee, replaces Faculty Policies and Procedures (FPP) Chapter 10 and is consistent with American Association of University Professors (AAUP) guidelines. The committee was formed in July after tenure protections were removed from state statutes as part of the 2015-17 state budget. The proposal will be presented to the Faculty Senate on October 5. A second reading and possible vote could be scheduled as early as the November 2 senate meeting. The proposal must also be approved by the University of Wisconsin Board of Regents. The following resolution was passed by the Faculty Senate in a special meeting on Tuesday, June 9.